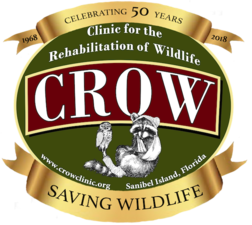 This year, Clinic for the Rehabilitation of Wildlife (CROW) celebrates its 50th Anniversary, and the celebration is already underway. 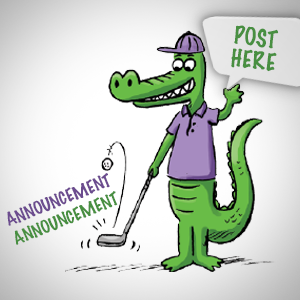 It kicked off on Jan. 8, with mayor Kevin Ruane's proclamation address at Sanibel City Hall. On Sunday, Jan. 14, CROW held a free open house at its Visitor Education Center, where guests could explore the venue and meet the animal ambassadors, as well as a behind-the-scenes experience at the hospital and its signature guided tour. The organization started up in 1968 when founder Shirley Walter came across an injured royal tern on the Sanibel Causeway. She took it upon herself to help the injured bird, but as there were no wildlife clinics around, she ended up rehabilitating the bird herself with the help of a veterinarian friend. Word spread quickly of her act of kindness and operating out of her home, she received more than 500 calls to help distressed animals in the first year. Additionally, we caught up with Heather W. Barron, DVM, Dipl. ABVP-avian, and hospital director at CROW, who shared her background, information about the organization's patients, an update on the aftermath of Hurricane Irma, and more. 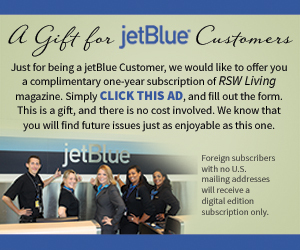 Times of the Islands Magazine: Tell us about yourself. 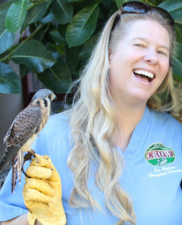 Dr. Heather W. Barron: I became CROW's Hospital Director/Head Veterinarian in late 2011. I received training in exotic and wild animal medicine and was later faculty at the University of Georgia, College of Veterinary Medicine. After that, I obtained further international experience as Professor and Department Head of Clinical Medicine at St. Matthew’s University, School of Veterinary Medicine in the Cayman Islands, where I was also the veterinarian for the Cayman Turtle Farm and Cayman Wildlife Rescue. I am a board-certified specialist and a licensed wildlife and sea turtle rehabilitator with more than 20 years of experience in practicing and teaching wildlife medicine. TOTI Magazine: What is CROW's mission? Barron: CROW’s mission is to save wildlife through state-of-the-art veterinary care, research, education and conservation medicine. TOTI Magazine: I see CROW has "patients" you care for. Can you tell us a little bit about that? Barron: CROW provides veterinary care for over 4,000 wildlife patients every year. These patients represent approximately 150 species of native and migratory wildlife that can be found here in Southwest Florida. TOTI Magazine: How have things been after Irma? Was there any damage? Increase in patients? Change in hours? Anything else? Barron: With the help of our dedicated volunteers, staff, students and the Sanibel community, CROW managed to “weather” Irma fairly well. Evacuation from Sanibel was mandatory, but the hospital was only closed one day and we continued to receive patients through our amazing partners at Specialized Veterinary Services in Fort Myers. There was some damage to the grounds and facilities at CROW, but all was quickly put to rights with the help of the community. The patients were all given the best possible care. Many more wild animals were brought to CROW after the storm. CROW continues to see wildlife emergencies 365 days per year! TOTI Magazines: Are there any volunteer opportunities available? What about donors? Barron: Yes! 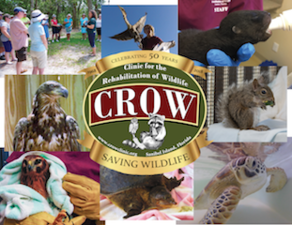 CROW relies on a dedicated team of over 200 volunteers which provide over 19,000 hours of service in areas such as baby care, laundry, tortoise grazing and visitor center/gift shop. As a 501(c)(3) nonprofit, CROW does not receive any federal, state, or local funding. It’s annual operating costs are funded mainly through private support from individuals, corporations, businesses and foundations. Fundraising events, grants and planned giving also contribute to finance the day-to-day operations with Memberships being a key fundraising effort. 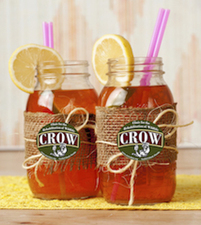 Visit www.crowclinic.org to make a donation or learn how to become a member! TOTI Magazine: What are your goals for the future? Where do you see CROW headed? Barron: We envision CROW as a center of excellence for education, collaboration, research and treatment of native wildlife. We have a commitment to the One World/One Health concept, which emphasizes a collaborative approach to the interrelated health of animals, people, and the ecosystem. TOTI Magazine: Is there anything else we should know about -- upcoming events, you, etc? In addition, we also offer Wildlife Walk hospital tours and seasonal programs including our Speaker Series and Lunch & Learn with me.